[February 21, 2007] Harrison William "Bill" Cook, 74, a longtime Springfield resident before retiring to New Mexico, died Feb. 14, 2007, at Lea Regional Hospital in Hobbs, N.M.
A memorial service will be at 4:30 p.m. Saturday, Feb. 24, at Broadwell Christian Church, with Dan Wagner officiating. Burial will be in McLean Cemetery, McLean, at a later date. 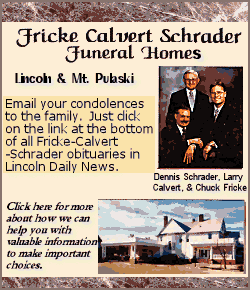 Local arrangements are by Fricke-Calvert-Schrader Funeral Home in Lincoln. Mr. Cook retired from the aviation industry after many years of service to Capitol Aviation and Garrett AiResearch in Springfield. 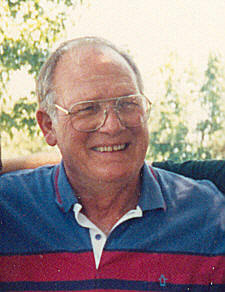 He was born March 9, 1932, at Broadwell to Harrison and Eva Rainwater Cook. He is survived by two sons, Kevin Cook of Hobbs, N.M., and Stephen Cook of Springfield; one daughter, Wanda Salzman of St. Louis, Mo. ; one stepdaughter, Kimberly Parnell of Las Vegas, Nev.; three sisters, Ollie Towner of Texas, Marlene Ely of Lincoln and Ruthann Ridgeway of Broadwell; one brother-in-law, Richard Martinie of Springfield; and five grandchildren, Ross Cook, Rae Salzman, Tyler Cook, Cody Cook and Lindsey Cook. He was preceded in death by his parents, three brothers, three sisters and one son, William. He raced stock cars in Lincoln and Springfield and loved to fly airplanes. Memorials may be made to Broadwell Christian Church. Click here to send a note of condolence to the Cook family.